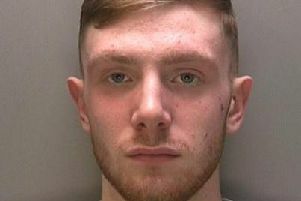 Lincolnshire Police are appealing for the whereabouts of a man after he allegedly assaulted a police officer in Gainsborough. The police is seeking information on the whereabouts of Ryan Sturnam, aged 29, from Scunthorpe but believed known in Gainsborough and Lincoln, who is wanted for an offence of assault police and possession of a controlled drug. It follows an incident on January 27 where three man chased another man before one man assaulted a police officer. A police spokesman said: “At around 5pm on Sunday January 27 we received a report of three men who were seen to chase another man in Gainsborough on Trinity Street. “Following our enquiries and in connection with this report we stopped a silver BMW in Blyton around 8pm. “One man, aged 37, from the Scunthorpe area, was arrested in connection with drug offences, he has been released under investigation. “There were two other men in the vehicle at the time it was stopped and they ran from the vehicle. “One of our officers, a police woman, was assaulted by one of the men as he ran off. “The third man is described as a white man, medium build with short dark hair. If you have any information, contact police on 101 quoting incident number 289 of 27 January. You can also contact the independent charity Crimestoppers, anonymously, on 0800 555 111 or its website.